Mochi muffins, typhoon-harbor crab, and other East Bay culinary delights. 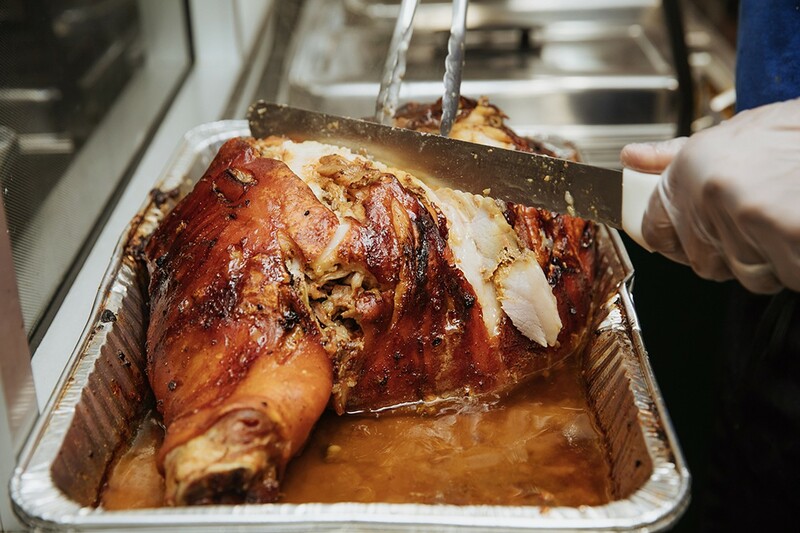 Borinquen Soul's pernil is roasted low and slow until it becomes a quivering mass of porcine goodness. In 2016, I found comfort in big bowls of soupy noodles, mourned the loss of my favorite pozole (at Aztecali) and favorite Mexican-Vietnamese fusion dishes (at Saigon Deli), and fell in love with Hayward's scrappy, immigrant-driven food scene. It has been a trying, deeply stressful year in so many respects — but also, at the same time, a very delicious year, punctuated from beginning to end with inspired, soulful cooking. Here are my ten favorite new-to-me dishes from this past year, listed in approximate chronological eating order. 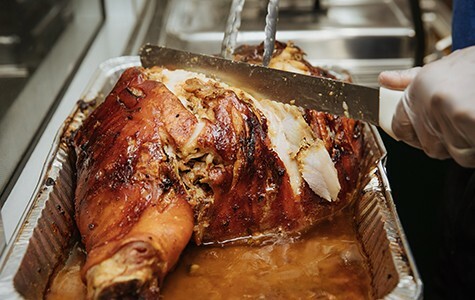 I'm cheating right from the get-go: I actually had my first taste of Borinquen Soul's Saturday-only roast pork shoulder, aka pernil, at the end of 2015 — too late to include it in last year's list. But if there was ever a dish worth memorializing, it's this one. Co-owner Eric Rivera tucks garlic, peppercorns, and various aromatics underneath the fatty skin of a pork shoulder, lets it marinate for 24 hours, and then roasts the whole thing low and slow until it becomes a quivering mass of porcine goodness, slick with salty, concentrated meat juices. A plate of that pork comes with orange-tinged arroz con gandules, which might be the most delicious rice dish in town, and a side of plantains — your choice of sweet maduros or savory, twice-fried tostones. It's a plate of food that's worth celebrating. The no-frills convenience-store setting, and the Borinquen Soul staff's Bronx-bodega swagger, is just an added bonus. The East Bay doesn't have any finer pasta than the egg-rich, ethereally light pasta that Michele Belotti rolls out each morning at his Rockridge restaurant. You can't go wrong if you order any of Belotti's Northern Italian pasta dishes, but the best of the best might be the casoncelli, a stuffed pasta based on the chef's mother's recipe. Each meat-stuffed bundle is shaped like a plump little bowtie, and is filled with chopped prosciutto, pork shoulder, and beef. Cubes of smoked pancetta and a heady, sage-infused brown butter sauce finish the dish. In a word: It is heavenly. As soon as Dungeness season approaches, I start counting down the days until my first crab feast of the year at this old-school Cantonese restaurant, which almost feels like an anachronism amid the sleek boutiques and upscale cafes of today's Uptown Oakland. The dish to get is the "Bay Fung Tong" style, named after a dish first served on the floating restaurants that used to be a fixture in Hong Kong's typhoon harbors (aka bei fung tong). Typhoon-harbor crab, as it's served at Bay Fung Tong, is cut into segments, batter-fried, and then buried under a mound of fried garlic, chilies, fermented black beans, and preserved pork — a savory-spicy flavor bomb that complements the natural sweetness of the crab meat. You can, and should, also order squid or scallops prepared in the Bay Fung Tong style. Either way, you'll need a lot of white rice. 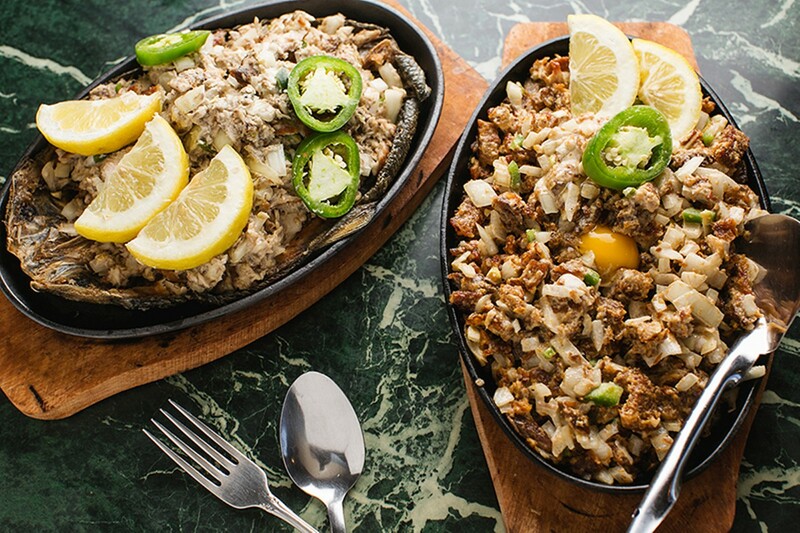 This modest, family-run Filipino spot in San Leandro serves the best pork sisig I've ever eaten. To prepare this stunner of a dish, skin-on pork belly is marinated overnight in soy sauce and citrus, then gets chopped up, deep-fried, and sautéed with onions and bell peppers. The meat arrives sizzling dramatically on a stone platter, at which point all conversation tends to cease. This is close to my Platonic ideal for crispy pork belly. The skin comes out outrageously crunchy, and the meat is tender and chewy without being the least bit dry. At the last moment, the cook cracks a raw egg on top for you to stir into the meat. Richness on top of richness. Sam Butarbutar's most popular creation isn't really a muffin at all. Rather, it's a Hawaiian-style butter mochi (i.e., Japanese glutinous rice cake) that the pastry chef has infused with the flavors of his Indonesian childhood: coconut milk, palm sugar, and the grassy Southeast Asian herb known as pandan. The chief innovation lies in Butarbutar's decision to bake the little, individual-portion mochi cakes in a muffin tin, which gives the dessert its outstanding texture — crispy on the outside and sticky-chewy on the inside, with a rich and buttery flavor that's instantly addictive. This bustling, down-home Sicilian restaurant is one of the only places in the East Bay where you'll find the kind of pizza known as sfincione, which is traditionally sold by three-wheeled street carts in the city of Palermo. Agrodolce makes its sfincione the proper Sicilian way, cut into thick, focaccia-like slices and topped with the hard sheep's milk cheese called caciocavallo. The best parts are the satisfying crunch of the olive oil-soaked bottom-crust and the pungent oomph of the anchovy-infused tomato sauce. Any number of dishes at this classically Japanese yakitori-ya in Temescal were worthy of inclusion in this list, starting with the myriad chicken parts that chef Tommy Cleary grills with the passion and precision of a real artist of the form. 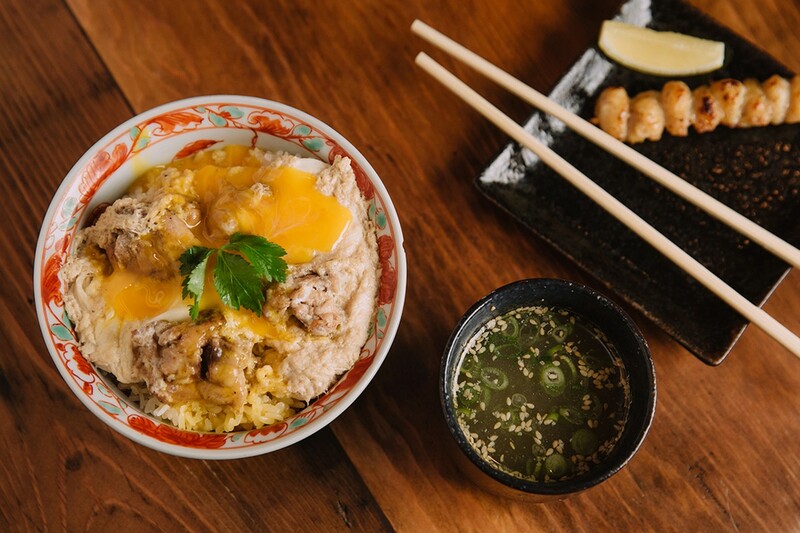 But the most memorable dish was the restaurant's suave take on oyakodon, the typically down-home pairing of chicken and egg (literally, "mother and child") served over white rice. Hina serves a soupy, extra-savory version of the dish that features smoky scraps of grilled thigh meat and, for the crucial finishing touch, a raw egg yolk and egg whites that are jiggly and just barely set. Mix everything together, and what you wind up with is pure comfort food — just the thing to warm you up on a chilly night. There is a proper time and place for a $15 fancy restaurant burger. But 2016 proved in many ways to be the year when the no-frills all-American fast-food burger asserted itself in the East Bay at restaurants as wide-ranging as LocoL and Blind Tiger. Good Time Fixins' Royale with Cheese is the best of the bunch. Named after a line in Pulp Fiction (about what French people call a Quarter Pounder), this is unabashedly a McDonald's-style quarter-pound cheeseburger — just made with much higher-quality beef. The burger is greasy and sloppy in just the right ways and comes topped with the classic fixins: shredded iceberg lettuce, a tomato slice, chopped onions, a Thousand Island-esque "special sauce," and thin-sliced dill pickles. Pro tip: Oaklanders can have this $6 cheeseburger delivered via the Caviar food-delivery app, which almost seems like an unspeakable luxury. In a year full of culinary surprises, few things surprised me more than to discover one of the best soul-food style smothered oxtail plates of my life, not at a proper soul food restaurant, but rather at an unassuming barbecue joint in Hayward. So it goes. I've rarely met a plate of oxtails I didn't like, but Just Potato Salad's uncommonly full-flavored version was soft and jiggly in the best kind of way. The plate comes with the full complement of soul-food side dishes: rice and gravy, black-eyed peas, mac 'n' cheese, greens, sweet potatoes, and a potato salad that's worthy of its status as the restaurant's namesake. For the time being, the oxtails are only available on Fridays, Saturdays, and Sundays. They're worth the drive to Hayward all on their own.